From left to right: ABS-CBN Global reporter Don Tagala, ABS-CBN News Chief Ging Reyes, and TV Patrol anchor Ted Failon. 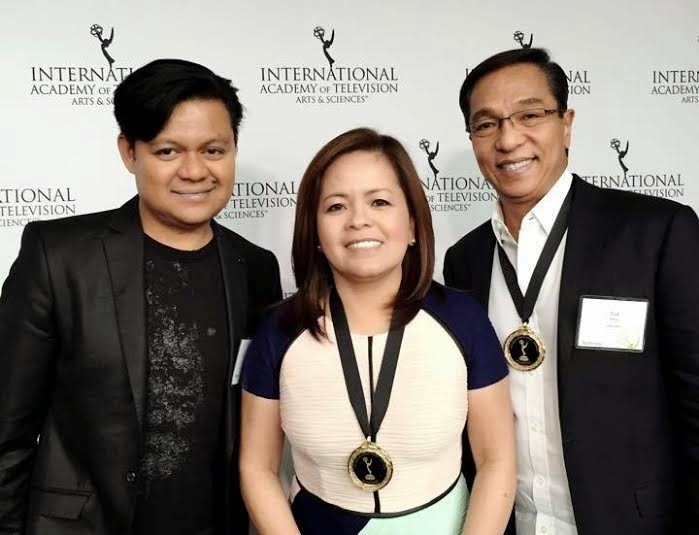 ABS-CBN’s “TV Patrol Weekend” gained recognition at the 2014 International Emmy Awards for News and Current Affairs in New York, USA for its special coverage of the aftermath of the world’s most powerful storm Typhoon Yolanda. The special coverage, which was aired a day after the typhoon struck the country, was one of the four nominees in the news category. ABS-CBN Integrated News and Current Affairs head Regina “Ging” Reyes and “TV Patrol” anchor Ted Failon, who was assigned to report from Tacloban and Cebu during the typhoon coverage, received medals for the nomination. The Emmy Awards for News and Current Affairs is widely considered to be the most prestigious award in television journalism. Its finalists are selected among entries from top international TV news channels by a panel of jurors made up of experienced television and journalism professionals.